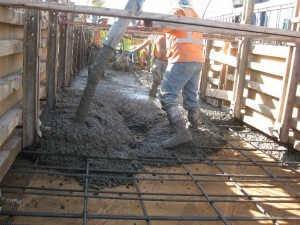 A cement mason work with concrete in construction. Career opportunities for those in the concrete profession remain strong despite the downturn in residential construction. In this free career guide, you will learn how to have a successful career as a cement mason. Job opportunities are expected to be good, especially for those with the most experience and skills. Most workers learn on the job or through a combination of classroom and on-the-job training that can take 3 to 4 years. Cement masons often have variable schedules and work overtime, with premium pay, because once concrete has been placed, the job must be completed quickly. Cement masons, concrete finishers, and terrazzo workers all work with concrete, one of the most common and durable materials used in construction. Once set, concrete—a mixture of Portland cement, sand, gravel, and water—becomes the foundation for everything from decorative patios and floors to huge dams or miles of roadways. Cement masons and concrete finishers place and finish concrete. They also may color concrete surfaces, expose aggregate (small stones) in walls and sidewalks, or fabricate concrete beams, columns, and panels. In preparing a site to place concrete, cement masons first set the forms for holding the concrete and properly align them. They then direct the casting of the concrete and supervise laborers who use shovels or special tools to spread it. Masons then guide a straightedge back and forth across the top of the forms to “screed,” or level, the freshly placed concrete. Immediately after leveling the concrete, masons carefully float it—which means to smooth the concrete surface with a “bull float,” a long-handled tool of about 8 by 48 inches that covers the coarser materials in the concrete and brings a rich mixture of fine cement paste to the surface. After the concrete has been leveled and floated, concrete finishers press an edger between the forms and the concrete and guide it along the edge and the surface. This produces slightly rounded edges and helps prevent chipping or cracking. Concrete finishers use a special tool called a “groover” to make joints or grooves at specific intervals that help control cracking. Next, they smooth the surface using either a powered or hand trowel, which is a small, smooth, rectangular metal tool. Sometimes, cement masons perform all the steps of laying concrete, including the finishing. As the final step, they retrowel the concrete surface back and forth with powered or hand trowels to create a smooth finish. For a coarse, nonskid finish, masons brush the surface with a broom or stiff-bristled brush. For a pebble finish, they embed small gravel chips into the surface. They then wash any excess cement from the exposed chips with a mild acid solution. For color, they use colored premixed concrete. Throughout the entire process, cement masons must monitor how the wind, heat, or cold affects the curing of the concrete. They must have a thorough knowledge of concrete characteristics so that, by using sight and touch, they can determine what is happening to the concrete and take measures to prevent defects. Segmental pavers lay out, cut, and install pavers—flat pieces of masonry made from compacted concrete or brick. This masonry is typically installed in patios, sidewalks, plazas, streets, crosswalks, parking lots, and driveways. Installers usually begin their work by preparing a base that has been graded to the proper depth and filled and leveled with a layer of sand. Installers then place the pavers in a pattern, normally by hand but sometimes by machine. Sand is then added to fill the joints between the pavers. Terrazzo workers and finishers create attractive walkways, floors, patios, and panels by exposing marble chips and other fine aggregates on the surface of finished concrete. Much of the preliminary work of terrazzo workers is similar to that of cement masons. Depending on the type of terrazzo, they usually first build a solid, level concrete foundation that is 3 to 4 inches deep. Second, after the forms are removed from the foundation, workers add a 1-inch layer of sandy concrete. Terrazzo workers partially embed, or attach with adhesive, metal divider strips in the concrete wherever there is to be a joint or change of color in the terrazzo. For the third and final layer, terrazzo workers blend and place into each of the panels a fine marble chip mixture that may be color-pigmented. While the mixture is still wet, workers add additional marble chips of various colors into each panel and roll a lightweight roller over the entire surface. When the terrazzo is thoroughly set, helpers grind it with a terrazzo grinder, which is somewhat like a floor polisher, only much heavier. Any depressions left by the grinding are filled with a matching grout material and hand-troweled for a smooth, uniform surface. 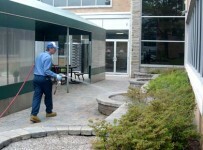 Terrazzo workers then clean, polish, and seal the dry surface for a lustrous finish. Work environment. Concrete, segmental paving, and terrazzo work is fast paced and strenuous, and requires continuous physical effort. A work week of 40 hours is the most common, although the number of hours can be increased or decreased by outside factors, such as the need to coordinate work with other jobs being done on the construction site. 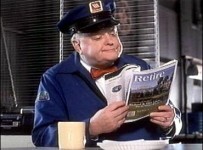 As a result, about 17 percent of workers have a variable schedule. Because most finishing is done at floor level, workers must bend and kneel often. Many jobs are outdoors, and work is generally halted during inclement weather. The work, either indoors or outdoors, may be in areas that are muddy, dusty, or dirty. To avoid chemical burns from uncured concrete and sore knees from frequent kneeling, many workers wear kneepads. Workers usually also wear water-repellent boots while working with wet concrete. Most cement masons, concrete finishers, segmental pavers, and terrazzo workers learn their trades through on-the-job training, either as helpers or in apprenticeship programs. Some workers also learn their jobs by attending trade or vocational-technical schools. Education and training. Many masons and finishers first gain experience as construction laborers. Most on-the-job training programs consist of informal instruction, in which experienced workers teach helpers to use the tools, equipment, machines, and materials of the trade. Trainees begin with tasks such as edging, jointing, and using a straightedge on freshly placed concrete. As training progresses, assignments become more complex, and trainees can usually do finishing work within a short time. Some workers train in formal apprenticeship programs usually sponsored by local contractors, trade associations, or local union-management committees. These programs combine on-the-job training with a recommended minimum of 144 hours of classroom instruction each year. In the classroom, apprentices learn applied mathematics, blueprint reading, and safety. Apprentices generally receive special instruction in layout work and cost estimation. Apprenticeships may take 3 to 4 years to complete, although completion times are increasingly variable as apprenticeship progression based on demonstrated competence instead of time is gaining popularity. Applying for an apprenticeship may require a written test and a physical exam. Many States have technical schools that offer courses in masonry which improve employment and advancement opportunities. Entrance requirements and fees vary depending on the school and who is funding the program. These schools may offer courses before hiring or after hiring as part of the on-the-job training. Other qualifications. The most important qualities employers look for are dependability and a strong work ethic. When hiring helpers and apprentices, employers prefer high school graduates who are at least 18 years old, possess a driver’s license, and are in good physical condition. The ability to get along with others is also important because cement masons frequently work in teams. High school courses in general science, mathematics, and vocational-technical subjects—such as blueprint reading and mechanical drawing—provide a helpful background. Cement masons, concrete finishers, segmental pavers, and terrazzo workers should enjoy doing demanding work. They should take pride in craftsmanship and be able to work without close supervision. Advancement. With additional training, cement masons, concrete finishers, segmental pavers, or terrazzo workers may become supervisors for masonry contractors or move into construction management, building inspection, or contract estimation. Certification programs offered through the National Concrete Masonry Association may allow workers to advance more quickly as they document higher levels of skill in working with concrete. Some workers eventually become owners of businesses, where they may spend most of their time managing rather than practicing their original trade. For those who want to own their own business, taking business classes will help to prepare. Cement masons, concrete finishers, segmental pavers, and terrazzo workers held about 207,800 jobs in 2008; segmental pavers and terrazzo workers accounted for only a small portion of the total. Most cement masons and concrete finishers worked for specialty trade contractors, primarily foundation, structure, and building exterior contractors. They also worked for contractors in nonresidential and residential building construction and in heavy and civil engineering construction on projects such as highways, bridges, shopping malls, or large buildings such as factories, schools, and hospitals. A small number were employed by firms that manufacture concrete products. Most segmental pavers and terrazzo workers worked for specialty trade contractors who install decorative floors and wall panels. Only about 5 percent of cement masons, concrete finishers, segmental pavers, and terrazzo workers were self-employed, a smaller proportion than in other building trades. Most self-employed masons specialize in small jobs, such as driveways, sidewalks, and patios. Average employment growth is expected, and job prospects are expected to be good, especially for those with the most experience and skills. Employment change. Employment of cement masons, concrete finishers, segmental pavers, and terrazzo workers is expected to grow approximately 13 percent over the 2008–18 decade, about as fast as the average for all occupations. Over the long run, more workers will likely be needed to build new highways, bridges, factories, and other residential and nonresidential structures to meet the demands of a growing population. Additionally, cement masons will be needed to repair and renovate existing highways and bridges and other aging structures. Additional funds for these projects are expected to come from the Federal Government, which plans to spend money on construction to stimulate the national economy by addressing necessary infrastructure repairs and renovating schools and other government buildings. The use of concrete for buildings is increasing because its strength is an important asset in areas prone to severe weather. For example, residential construction in Florida is using more concrete as building requirements are changed in reaction to the increased frequency and intensity of hurricanes. Concrete use is likely to expand into other hurricane-prone areas as the durability of the Florida homes is demonstrated. Job prospects. Opportunities for cement masons, concrete finishers, segmental pavers, and terrazzo workers are expected to be good, particularly for those with the most experience and skills. Employers report difficulty in finding workers with the right skills, as many qualified jobseekers often prefer work that is less strenuous and has more comfortable working conditions. There are also expected to be a significant number of retirements over the next decade, which will create more job openings. Applicants who take masonry-related courses at technical schools will have better opportunities than those without these courses. Employment of cement masons, concrete finishers, segmental pavers, and terrazzo workers, like that of many other construction workers, is sensitive to the fluctuations of the economy. Workers in these trades may experience periods of unemployment when the overall level of construction falls. On the other hand, shortages of these workers may occur in some areas during peak periods of building activity. In May 2008, the median hourly wage of terrazzo workers and finishers was $17.25. The middle 50 percent earned between $13.65 and $23.12. The bottom 10 percent earned less than $10.82, and the top 10 percent earned more than $30.12. In May 2008, the median hourly wage of segmental pavers was $13.17. The middle 50 percent earned between $10.77 and $16.41. The bottom 10 percent earned less than $9.14, and the top 10 percent earned more than $19.33. Like other construction trades workers who are paid by the hour, earnings of cement masons, concrete finishers, segmental pavers, and terrazzo workers may be reduced on occasion because poor weather and slowdowns in construction activity limit the amount of time they can work. Nonunion workers generally have lower wage rates than union workers. Apprentices usually start at 50 to 60 percent of the rate paid to experienced workers, and increases are generally achieved by meeting specified advancement requirements every 6 months. Cement masons often work overtime, with premium pay, because once concrete has been placed, the job must be completed. About 14 percent of cement masons, concrete finishers, segmental pavers, and terrazzo workers belong to unions, the largest of which are the Operative Plasterers’ and Cement Masons’ International Association of the United States and Canada, and the International Union of Bricklayers and Allied Craftworkers. A few terrazzo workers belong to the United Brotherhood of Carpenters and Joiners of the United States.